@AmericanAir has more than 393,000 followers. And so far this year, American has racked up around 2,500 daily mentions and posts across various social media platforms including Twitter, Facebook [FB 28.09 -0.155 (-0.55%) ] and blogs. In this age of high tech and high volume air travel, it's no surprise that the way airlines manage their social media communities is a great predictor of how they will fare in the competitive travel industry. Watching airlines online profiles is also a great way to observe branding and case studies. 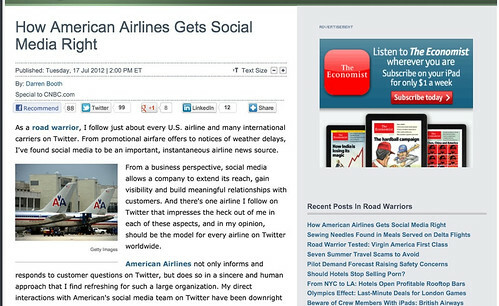 In the article above from CNBC, How American Airlines Gets Social Media Right, an interview with Jonathan Pierce, American's social media director, reveals how much customer service is key in social interaction. "Our team is focused on providing exceptional customer service, responding and inspiring customers to fly American with practical travel advice and assistance, all with a human touch. Given the evolution and expectation shift in how our customers are engaging with us, we are moving from communication to conversation. I have a team of fun, fresh, innovative thinkers — their personalities naturally are expressed into our social communities. There's an understanding of when it's appropriate to insert personality, compassion and understanding into the conversation." Of course, Virgin America is front and center when discussing not only social media, but super sophisticated branding and marketing, from the logo embedded signature red napkins, to the customized experience of being able to watch your movie, and ordering everything from a $5 package of peanuts to a $5000 watch. In this video interview with social media manager Jill Fletcher, taken at SXSW2012, Jill explains key factors to success for Virgin. Having everyone from the top down invested in social media, including, of course, Richard Branson, is one factor. Being part of an innovative team and willing to experiment, as well as being a fairly young airline that launched during the birth of social media 5 years ago, are also critical. I flew Virgin America last summer, and have to agree that its branding and marketing were superior to many other airlines I'd seen. This year for the same trip, however, I flew United instead, as its conversion rate of points to dollars was much more generous than Virgin's-- which goes to show that social media is only one factor when it comes down to actually buying a ticket. 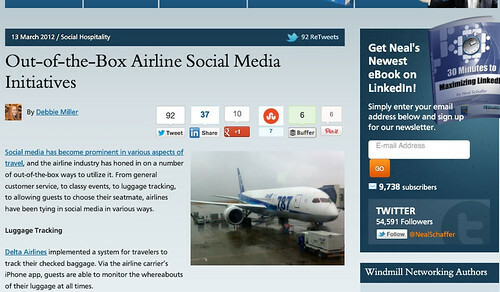 In Out-of-the Box Airline Social Initiatives, Debbie Miller, posting for Windmill Networking, highlights effective mini campaigns, such as Delta's iPhone app for monitoring luggage; Jet Blue's $4 flights from LA to Burbank, which received so much positive press and social media buzz, it was well worth it; and "Meet and Seat" by KLM, which allowed passengers to select their seating neighbors according to social media profiles. So, what say you? Have you had good social media experiences with the airlines mentioned here, as well as other airlines like Southwest, or Hawaiian Airlines, for example. Share in the comments here.